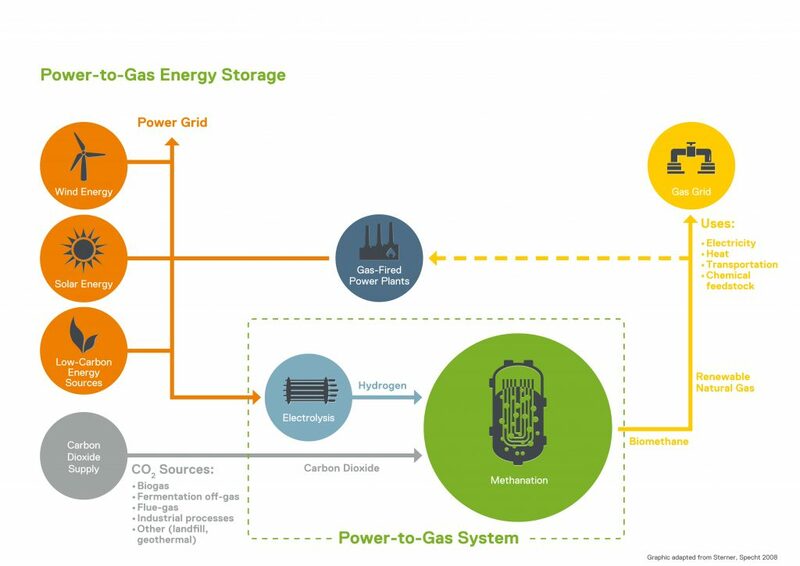 for utility-scale energy storage, grid balancing, and carbon reuse. Electrochaea has developed a commercially viable and disruptive solution for utility-scale energy storage, grid balancing, and carbon reuse. Our proprietary process converts low-cost and stranded electricity and carbon dioxide into pipeline-grade renewable gas for direct injection into the existing natural gas grid, a conversion process known as “power-to-gas”. The core of our power-to-gas system is a selectively evolved microorganism – a methanogenic archaea	– that excels through unprecedented catalytic ability and industrial robustness. The technical advantages of this biocatalyst enable our patented BioCat methanation technology to operate at lower capital and operating costs and with greater flexibility than conventional thermochemical methanation processes. Electrochaea GmbH is a dynamic early stage company with headquarters, engineering and development teams in Munich, Germany, and a commercial scale demonstration facility in our Danish subsidiary. The Electrochaea story starts in the year 2006 with basic research and four years of proof of concept in Prof. Laurens Mets’ laboratory at the University of Chicago. In 2011, first field trials with raw biogas at a brewery digester in St. Louis, MO, Electrochaea LLC demonstrated that the technology was compatible with untreated industrial biogas sources. A subsequent pre-commercial field trial demonstrated scalability in a 10,000 L reactor at Aarhus University’s Biogas Research Center in Foulum, Denmark. This trial was partially funded by the Danish Energy Agency and supported by Aarhus University, E.ON, Erdgas Zürich, EWZ and NEAS Energy. Following completion of the Foulum project, Electrochaea LLC and a group of German and Swiss investors, founded and financed Electrochaea GmbH in 2014. In the same year, Electrochaea received funding from Energinet.dk to design, build and operate the BioCat Project: A 1-MW commercial-scale field trial at a wastewater treatment plant outside Copenhagen, Denmark. This project is operated by Electrochaea and its BioCat project partners Hydrogenics, Audi, HMN Gashandel, NEAS Energy and BIOFOS. The BioCat Project began commissioning in early 2016 and provides an operating demonstration plant for Electrochaea and its partners. It will bring revenues from the sale of renewable natural gas in Denmark, and decarbonize the Danish gas grid. We will achieve market entry with a commercial product in 2016. Archaea have populated Earth for more than three billion years and are believed to have been among the first living organisms on the planet. Along with bacteria and eukaryotes, they form the third kingdom of life in the phylogenetic taxonomy. The Electrochaea strain is a single-celled, autotrophic organism and feeding exclusively on hydrogen and carbon dioxide, while producing almost exclusively methane (renewable natural gas).